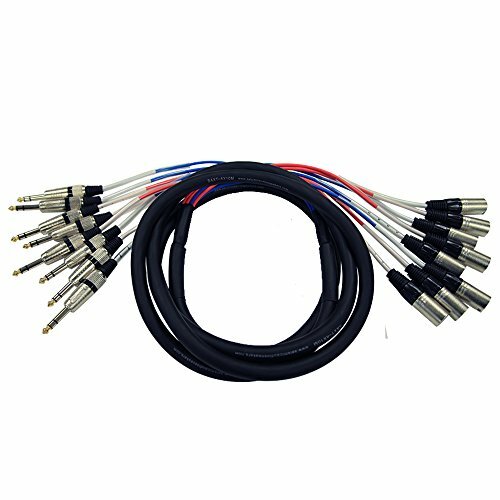 8 Channel 10' XLR Male to 1/4" TRS Snake Cable - Model # SAXT-8x10M, 10 feet from tip to tip, Channels: 8 each TRS Male 1/4" & Male XLR connections, Color coded for easy hook up, Audio frequency controlling cable, This snake cable is brand new, One year warranty. Shielded and balanced, this snake is ideal for use in the recording studio or live applications. XLR Male on one end, 1/4" TRS on the other. 22g Oxygen-Free Copper (OFC) conductors for enhanced signal clarity and superior RF rejection.